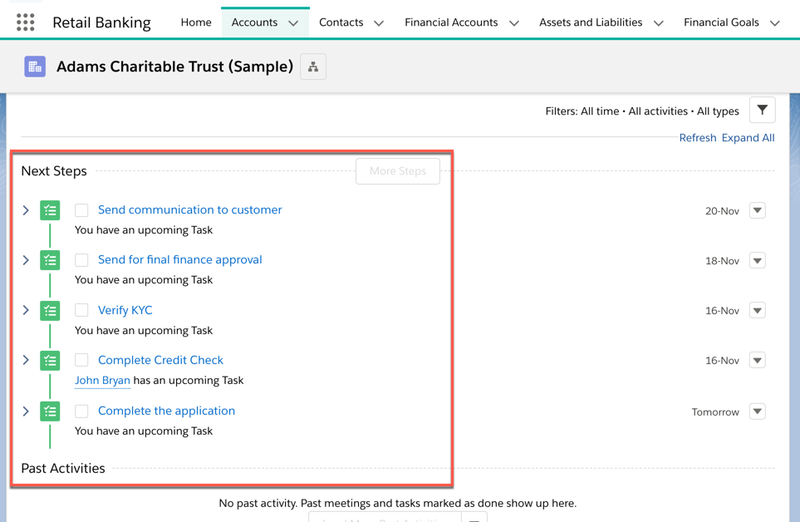 In Winter '19 release, Salesforce introduced Action Plans for Financial Services Cloud. It captures repeatable tasks in templates and then automate the task sequences with an action plan. Example: Processing Loan application, Customer on-boarding process etc. It will also give you the option to create reports and dashboards to monitor progress and ensure compliance. 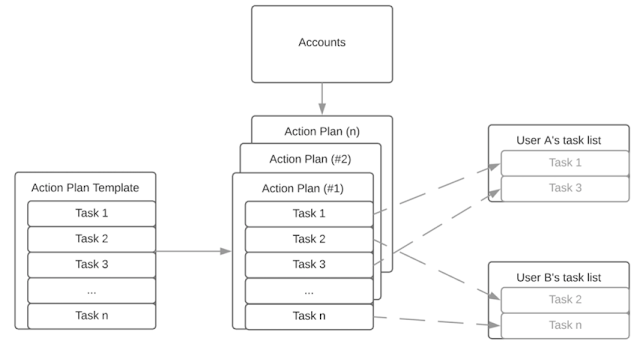 Action Plan Template: Power consistent customer experiences with configurable task templates. Process Automation: Increase productivity by automatically generating tasks with due dates and role based assignment. Plan Execution: Drive collaboration and complaint task completion with analytics and enforcement of required tasks. An action plan template is nothing but a list of tasks to complete a business process. In a template, each task is given a priority, the deadlines (the number of days in which it should be completed - data offset), and who is responsible. 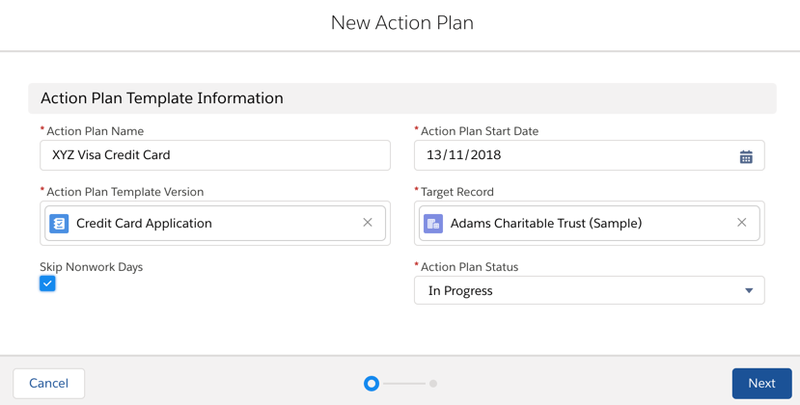 Then this action plan template is used to create action plans with each task assigned to a user with a completion date. Permission Set: You need to assign permission set - ActionPlans to the users. Without this permission set, you will not be able to assign action plan task to those users. Action Plan: Read, Create, Edit and Delete. 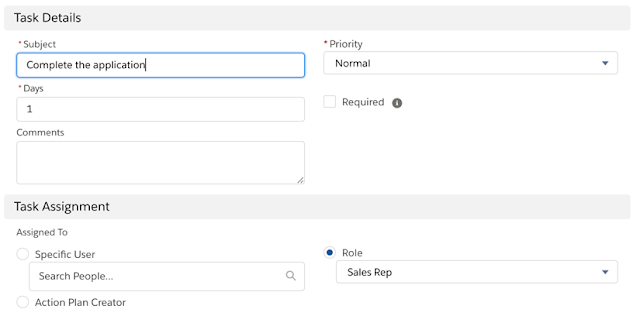 Status Field Required: This is required to accurately track and report on action plans based on their status. Set the Action Plan Status as mandatory field in Action Plan layout. Action Plan List to Account Page Layout: Add action plan related list in Account Page layout. 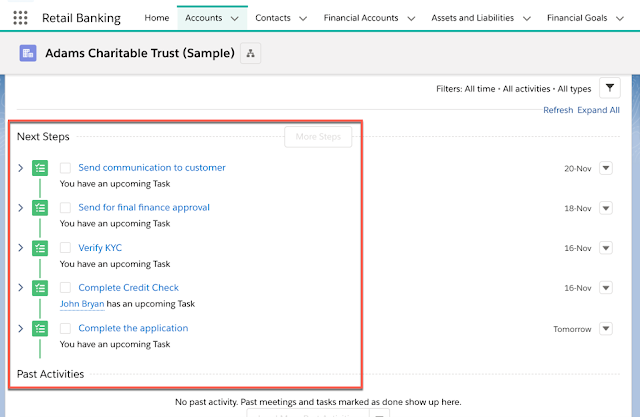 Action Plan Lightning Component: Add the Action Plans List - Financial Services Cloud Lightning Component in the page in a separate tab. Setup Nonwork days: Use this option to skip nonwork days when setting up the task completion dates. To do that, you can set the Business Hours and setup company-wide holidays. We will use Action Plan Template to automate new credit card opening processes for financial institute XYZ and then use the template to create the action plan for one of the account. Finally we can publish the action plan template. 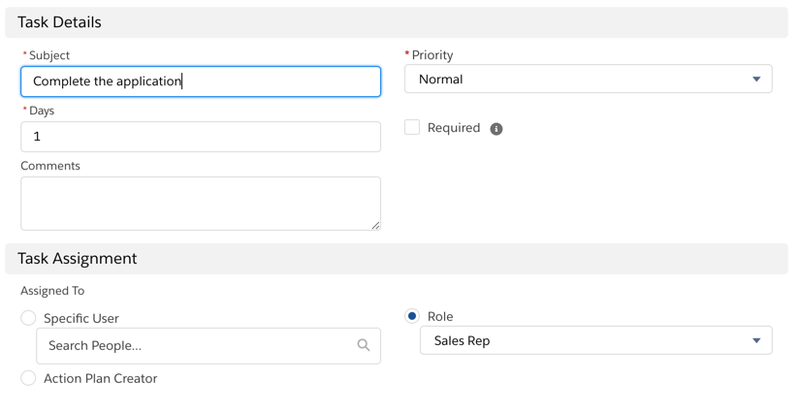 What happened at the backend, Salesforce has created all the tasks and assigned to owners based on the task configuration. We can see the same from account's task view.